The catering report will detail the catering department of your competitive hotels. We can include everything from Food and Beverage minimums to attendee minimums. You may request any of your own criteria. A typical report will include specific menu items such as the price for coffee per the gallon, continental, buffet, and plated breakfast, average costs for morning and afternoon meeting breaks. Plated, buffet, and boxed lunches, cold and hot Hors D’oeuvres, reception stations, (i.e. carving, pasta, specific food type display) plated and buffet dinner, open and cash bar services, any specific brand alcohol pricing, and all additional fees for attendant services. There is also a comments sections where details of the conversation with the catering department are recorded. If we aren’t able get all the information during the first call, we will note how many calls it takes to complete the task. We also note if our agents ran in to any difficulties with the staff we spoke with. 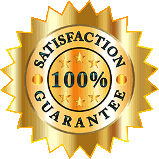 If there are any special requirements such as attendance minimums, deposits, and/or attrition clauses, those will be included in the comments section of the report as well. To complete the shop, a call is made to the catering department of the hotel. Our agent asks for the average prices of the specific items that you have requested. The information is recorded on to an excel spreadsheet. While on the phone with catering, we always ask for copies of any menus that they can provide to us. These menus are passed along to you with the report in an email. Some smaller boutique hotels, as well as limited service locations, may use outside catering services, if that is the case, we will attempt to get the information directly from that source and make note of it on the report. 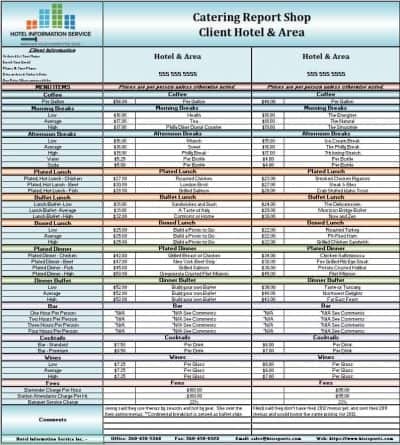 Base pricing for these reports will include 5 of your competitor hotels, any additional hotel can be requested for a nominal cost. Turnaround time is typically 7-10 business days.